‘The Battle of Algiers at 50: Legacies in Film and Literature’ is a one-day symposium organised by postgraduate students from the University of Leeds and Sheffield from the fields of Francophone studies and Geography. The symposium will offer a transdisciplinary platform for bringing together researchers at all stages in their careers who are interested in transcultural politics, literature and film, with the specific objective of considering the legacy and the futures of the anti-Colonial epic The Battle of Algiers 50 years since its release in 1966. The formative effect that The Battle of Algiers has had on cinema in North Africa cannot be underestimated. It has largely been celebrated as an accurate and balanced depiction of violence during the battle of Algiers, and by extension, the Algerian War for Independence (1954-62). However, The Battle of Algiers is a film that has led many afterlives which transcend national and cultural borders. Both celebrated as an anti-colonial epic and example of Algerian nationalist heroism, the film, conversely, has also been held up as a document of French military expertise. 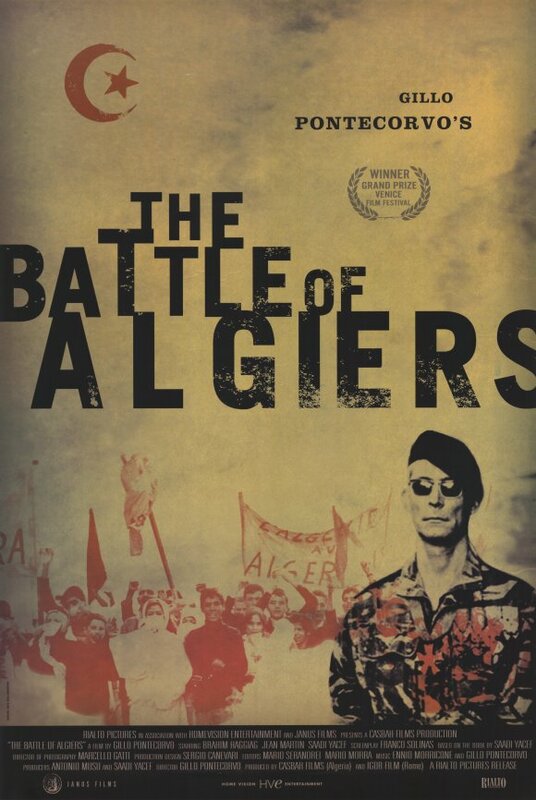 The Criterion Collection’s 2004 re-release of the film in the United States demonstrates the constantly shifting status of the film on the global stage, featuring commentary from contemporary directors such as Spike Lee, but also interviews with counterterrorist experts in ‘The Battle of Algiers: A Case Study’. This symposium is a unique opportunity to consider how these various legacies of The Battle of Algiers continue to inform understandings of Algerian history, but also influence perspectives on political violence and national identity throughout North Africa and beyond. What does it mean to consider the film as a ‘case study’ in terrorist and counterterrorist activities? How can we think about film as an alternative historical narrative of decolonization? In what ways has Pontecorvo’s The Battle of Algiers influenced cinema and the arts in Algeria and beyond? We are delighted to welcome Dr Jamal Bahmad from the University of Leeds as the keynote speaker. Please send abstracts for papers (300 words) to Alex Hastie, Beatrice Ivey and Takfarinas Abdiouene at batailledalger50@gmail.com by the 15th January 2016. While the principal language of the symposium will be English, the organisers welcome contributions in French and Arabic.